Game Comparison / Review: Commander: The Great War and Strategic Command World War I.
I had the distinct pleasure of being a beta tester for Slitherine and The Lordz Games Studio for Commander: The Great War. I thought it would be a worthwhile undertaking to not only offer up a review of Commander: The Great War but also a comparison and contrast with Fury Software’s and Battlefront‘s Strategic Command: World War I. Let me begin by noting that both games are high quality and provide a lot of hours of entertaining gaming. If you can afford both – I recommend both…but if you can’t, or if you prefer a certain type of game, I hope this article will help you make an informed purchasing decision. Both Commander: The Great War and Strategic Command: World War I are historical, turn-based strategic simulations of World War I. As such, this usually means less graphical dazzle and more substantive gameplay – and neither disappoints on this front…in fact, the graphics in both games are beautifully rendered. Commander: The Great War has a bit of “beer and pretzels” feel to it. I do not mean “beer and pretzels” as an insult but rather to simply note the type of game. I personally prefer games which have a bit of “beer and pretzels” feel to them – so I don’t spend my entire life attempting to complete one game! 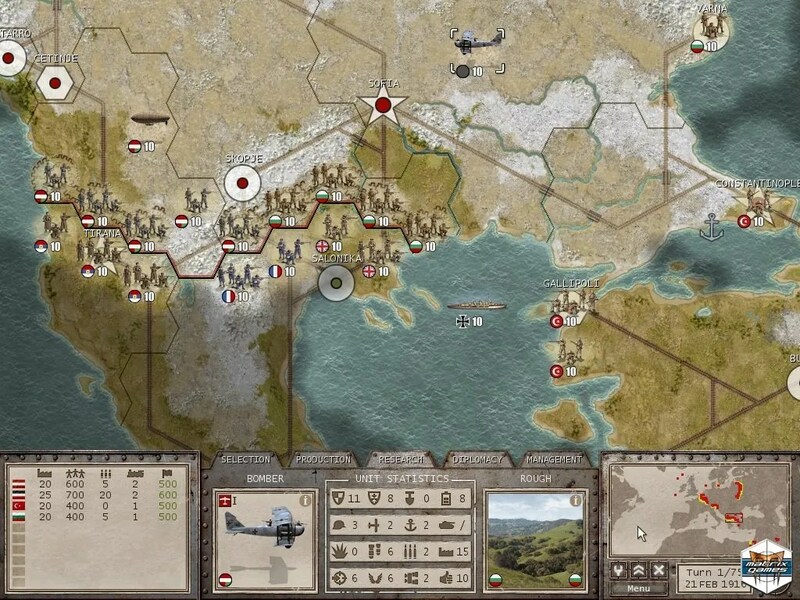 Commander: The Great War includes several scenarios which allow you to start at various points during the war – but they are all on the same map and essentially the same game from different points in time. In contrast, Strategic Command offers several different scenarios which in addition to allowing one to play through the war at various points also allow one to play different scenarios which occur on different maps – sometimes at the operational level, etc. instead of strategic. Because of this SC has a much greater amount of replayability than Commander: The Great War. Still, one should derive many hours of gaming from Commander. Commander: The Great War’s gameplay is fairly straightforward and without a lot of nuances. You’ll recruit units, research technologies, declare war, fight naval battles, and so on. Strategic Command has much greater depth. Throughout the game one is prompted to make decisions about various scenarios (e.g. send a unit to the Baltic or the Adriatic? support an uprising in Ireland?) and the diplomatic abilities are greater – going beyond just declaring war. I own Fury / Battlefront’s Strategic Command WWI (and Breakthrough), so how does Commander: The Great War stack up? I’d say Fury’s game is a bit deeper and more challenging, but that Commander: The Great War is more satisfactory as a beers and pretzels wargame Fury’s game also has more replay-ability – the scenarios available are truly different, whereas The Great War’s are all on the same map just beginning in different years. I play historical wargames in large part as an educational experience. The games teach me geography, historical events, the names and types of units, who leaders of various units where and so on. On this front Commander is somewhat disappointing with minimal historical events and generic names for units. Strategic Command is much more satisfying. Commander excels in its speed. SC kills me with how long it takes the AI to execute its turn, each and every turn. By comparison, Commander is straightforward and quick. I haven’t played the games enough to compare the AI capabilities, but Commander is much more enjoyable if you want a fast-paced game. In addition, Commander’s user interface has some small but beautiful enhancements over SC’s interface. For example, one can go into “repair mode” and repair multiple units with a simple click – no right clicking and selecting max and okay for each and every unit! Commander also features an event summary at the end of each turn – something which I’ve been asking for since Strategic Command 2 initially came out and which, sadly, SC still lacks! It may seem a straightforward choice: Strategic Command wins on most fronts. But, it really depends on the sort of game you are looking for. If you want something fast-paced, go with Commander – if you are looking for more depth and historical events – go with Strategic Command. If you are a new gamer, go with Commander – if you are an experienced gamer choose Strategic Command. Whichever game you purchase, I doubt you’ll regret it! Ohh, and on another note which I will perhaps write about more fully at some point in the future…I’d like to suggest to companies like Matrix Games and Slitherine that they consider pricing their games differently. Sure, $40 for a game ensures that fewer copies will generate a larger profit, but I’m pretty sure that if you took the games down to say $10/ea. or even $20/ea. the sales would increase exponentially – resulting in greater profitability in the long run. Think Minecraft! I agree, it’s pretty expensive, although the “king” in this regard is Gary Grigsby’s War in the East. Guess I’ll grab it when there’s some kind of sale. Loved Panzer Corps, and Commander TGW is made by the same team. Thanks for the recommendations. I’m interested in getting my hands on Grigsby’s War in the East (though more the American Civil War, which is more my time period). I wasn’t aware Panzer Corps was made by the same team as TGW…may have to check that out as well. The graphics style in Commander TGW is similar to Panzer Corps. They were both developed by The Lordz-studio from the Netherlands, but in case of Panzer Corps a russian modder who already did his own Panzer General remake did all the mission design etc. If you know Panzer Corps 1, you’ll love it (because it recreates and expands, in some time reduces missions from the original Panzer General campaign, but with fare more units etc.). The DLCs expand it to cover almost the entire war in over 100 missions. I’d also recommend Unity of Command (set on the Eastern Front in WW2, specifically the whole Stalingrad campaign), which is even superior to Panzer Corps in regards to Beer & Pretzel wargaming (but hasn’t got as much missions). It’s also available on Steam and on Slitherine/Matrix, but if you buy it from their site you’ll get a Steam key as well (and the DRM free version). An expansion is set to come out in the beginning of the next year covering the advance of the Soviets towards Berlin. Please….use some common sense. Minecraft sold well not because it was cheap, but because it was and continues to be a wonderful concept, you seriously can’t compare Minecraft with this game. Secondly, you never ran a software company to know if lowering the price with 50% will increase sales numbers with at least 100% (to get at least the same profits, sales aren’t just a matter of simple math. I think 10 $ would be a too low price for the amount of content/ replayability/ long term value the game gives you, especially since it’s a Grand Strategy game that takes quite some time for one playthrough. For my part, I’ll wait for sales on Matrix and Slitherine to get Command TGW, because at present it’s too expensive for me (20-25 Dollar would be OK though). Next story Free Book from Ted Dekker. Previous story Movie Review: Bernie (PG-13).